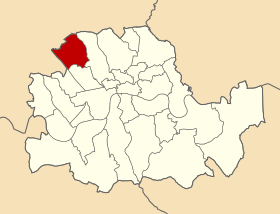 The Metropolitan Borough of Hampstead was a Metropolitan borough of the County of London from 1900 to 1965, when it was amalgamated with the Metropolitan Borough of St Pancras and the Metropolitan Borough of Holborn to form the London Borough of Camden. It included Primrose Hill, Hampstead, Belsize Park, West Hampstead, South Hampstead, much of Hampstead Heath and part of Kilburn and Cricklewood. Some street signs still bear the 'Borough of Hampstead' name. Street sign still bearing the 'Borough of Hampstead' name in 2007. The arms were granted in 1931, and are based on a device used by the Hampstead Vestry without authority, and adopted by the Council on its formation in 1900. The mitre stands for the Westminster Abbey, to which the Manor of Hampstead was granted by Ethelred the Unready in 986, and remained in its possession until 1539. The fleurs-de-lys and stag's head are from the arms of the Hickes family, one of whom, Viscount Camden, purchased the Manor. On his death in 1629 it passed to the Noel family from whose arms are taken the fretty chief. The Manor was sold to Sir William Langthorne in 1707, who is represented by the white cross and red fleurs-de-lys from his arms. The holly is from the seal of the old Hampstead Vestry, which grows profusely in the area. Charges from these arms were used, together with charges from the coats of arms of Holborn and of St. Pancras, when the new coat of arms of the London Borough of Camden was designed in 1965. The metropolitan borough was conterminous with the Vestry authority, when it was formed in 1900. Statistics compiled by the London County Council, in 1901 to show the population growth in London, over the preceding century. 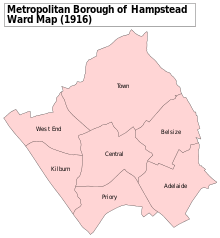 A map showing the wards of Hampstead Metropolitan Borough as they appeared in 1916. 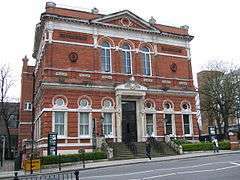 Under the Metropolis Management Act 1855 any parish that exceeded 2,000 ratepayers was to be divided into wards; however the parish of St John Hampstead did not exceed this number so was not divided into wards. By 1873 its population had increased enough for the incorporated vestry to be divided into four wards (electing vestrymen): No. 1 (18), No. 2 (15), No. 3 (15) and No. 4 (12). In 1894 as its population had increased further so the incorporated vestry was re-divided into five wards (electing vestrymen): Town (18), Belsize (12), Adelaide (9), Kilburn (21) and West End (12). The metropolitan borough was divided into seven wards for elections: Adelaide, Belsize, Central, Kilburn, Priory, Town and West End. ↑ , 'Hampstead: Churches', A History of the County of Middlesex: Volume 9: Hampstead, Paddington (1989), pp. 145-152. Date accessed: 13 March 2014. ↑ Statistical Abstract for London, 1901 (Vol. IV). ↑ The London Gazette Issue: 23955. 4 March 1873. pp. 1370–1371. Retrieved 9 April 2015. ↑ The London Gazette Issue: 26526. 26 June 1894. p. 3673. Retrieved 9 April 2015. ↑ The London Gazette Issue: 26548. 4 September 1894. pp. 5154–5155. Retrieved 9 April 2015. ↑ Post Office London County Suburbs Directory, 1919. 1919. Retrieved 18 February 2015. Robert Donald, ed. (1907). "London: Hampstead". Municipal Year Book of the United Kingdom for 1907. London: Edward Lloyd.